Two separate, yet intertwined views of the sky emerge through a screen of semi-transparent dual-layered fabric curtains. From the building’s exterior, a slightly iridescent, metallic surface reflects, matches, and refracts the color of the sky above as the sky flows over the curtains: an ever-changing sea of sky. From within, the vivid blue layer of cloth alters the color of light entering the building creating a moving, yet constant sky-blue glow. 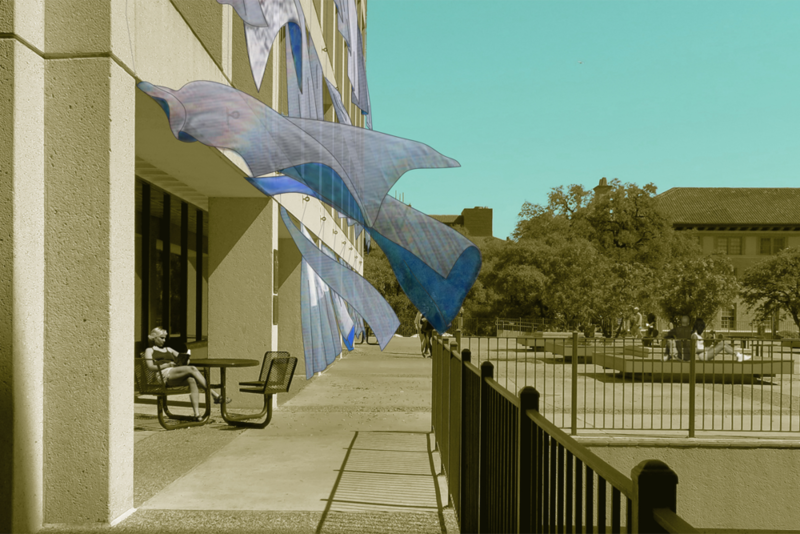 As the curtain separates inside from out, these two experiences cannot be felt simultaneously, but the erratic movement of the wind allows bright blue to flick over the face of the building as the curtains flip in the wind connecting the two sides. Even at ground level, the curtains continue to match the same square grid as the floors above. By keeping the same unit curtain size, the pathway into the arcade and building is merely hidden, not blocked or restricted. The reversal of the curtain's location from inside to outside gives a new life and atmosphere to its movement in the wind as well as has changed the role of its internal vs. external qualities: the outside becomes more inviting than the inside. Here, the University of Texas at Austin’s campus' outside spaces become more like an interior space and more inviting than the buildings within it.